Single-Handed: Complete Collection - BUY THIS DVD! 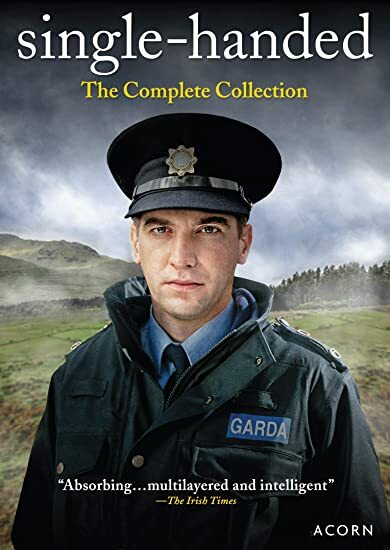 Set against a landscape of epic beauty and isolation, this Irish police drama delves into a world rife with conflicted characters and moral ambiguity. Garda Sergeant Jack Driscoll (Owen McDonnell, Dominion Creek) returns home to the windswept west coast of Ireland to patrol the insular community of his youth. But small-town life presents challenges Jack never faced in Dublin—chief among them, winning the villagers’ respect and escaping the shadow of his father (Ian McElhinney, Game of Thrones), a retired policeman. Fighting corruption and those who would take the law into their own hands, Jack investigates heinous crimes, including a child’s abduction, murder dressed up as arson, and a local schoolgirl’s involvement with a Dublin pimp. With “powerful, charismatic performances” (Evening Herald, Ireland) and complex, realistically drawn characters, these “quietly brilliant” (The Sun, UK) mysteries also star David Herlihy (The Clinic), Ruth McCabe (Philomena), Matthew McNulty (The Terror, Versailles), Simone Lahbib (Loch Ness), Sean McGinley (Shetland), Stephen Rea (The Honorable Woman), and Caroline Catz (Doc Martin). THEN SEND IN YOUR NAME AND ADDRESS TO contests@efilmcritic.com. Put "i caught you single-handed" in the subject line and cross your fingers. We will draw names and one of the DVD packages from Acorn Media could be yours. Only 1 entry per household.